With the release of the latest Star Wars movie last December I was reminded of my facination with the series as a kid. I had always been most fascinated with Han Solo’s blaster. 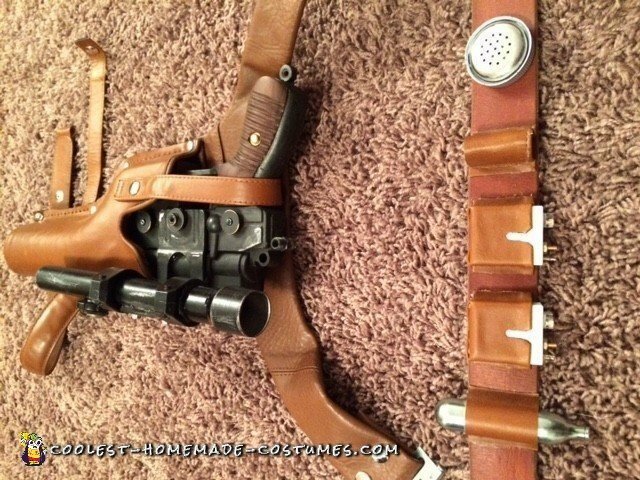 So I decided make my version of Han Solo’s blaster costume. I did not have any overarching plan. Rather, I scoured various thrift stores for anything that seemed like it could be useful. Surprisingly, I started with a M-16 squirtgun and worked from there. Some of the other parts I used included a bi-fold door adjustment plate, sprinkler pipe, broom handle, bottle caps, copper pipe, hose clamps, a liquor shot dispenser, lamp fittings, lamp knobs, a fire extinguisher, air fittings, misc hardware bolts, screws and washers along with two scrap pieces of black walnut. I was pleased with Han Solo’s blaster costume so far, but realized I needed a holster. 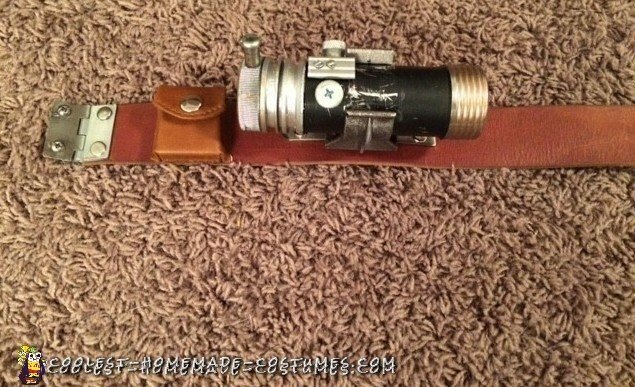 I built the holster out of two purses, an old belt, snaps, a hair gel bottle, window blind brackets, a milk jug cap, salt and pepper shakers, phone jacks, a relay baton, a flashlight clamp, a coffee pot spout, hinges, scrap steel plates, a CO2 canister, magnets & other misc hardware. The blaster and holster were a tremendous success, and I managed to build the entire unit for about $40. Wow! I just turned a pile of junk into a work of art, but it felt incomplete. I knew I had to create the entire Han Solo’s blaster costume. Since I was too old to pull off Han Solo from the original series, so I chose to go with Han Solo from Episode 7. I started the blaster with a squirt gun that looked like an M-16. After cutting off the portions of the squirt gun that I didn’t want, I started building up the details. 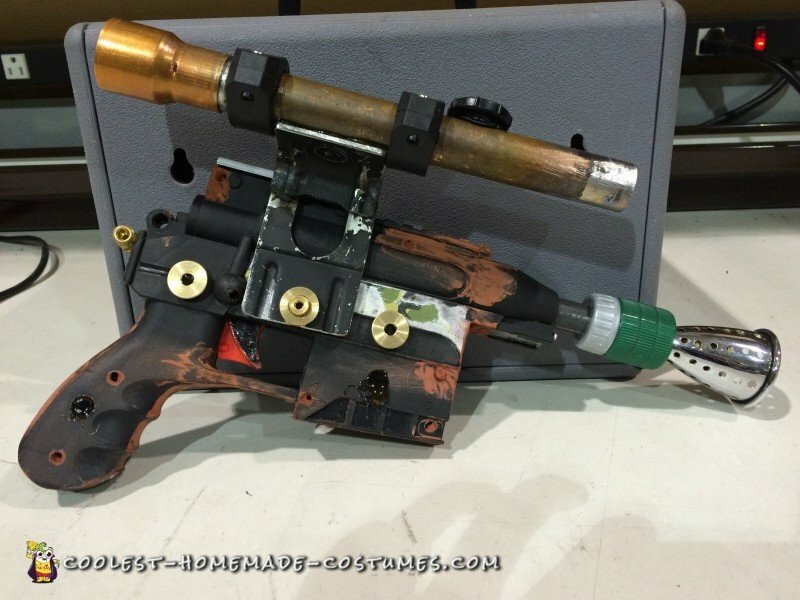 The scope was made out of copper plumbing pieces and garden hose clamps, and I used a fire extinguisher bracket to mount the scope to the pistol body. I cut a liqueur shot dispenser in half and drilled a series of holes to simulate the blaster flash muzzle. A Dasani water bottle cap and 3 Diet Coke bottle caps along with a broom handle made the rest of the barrel. 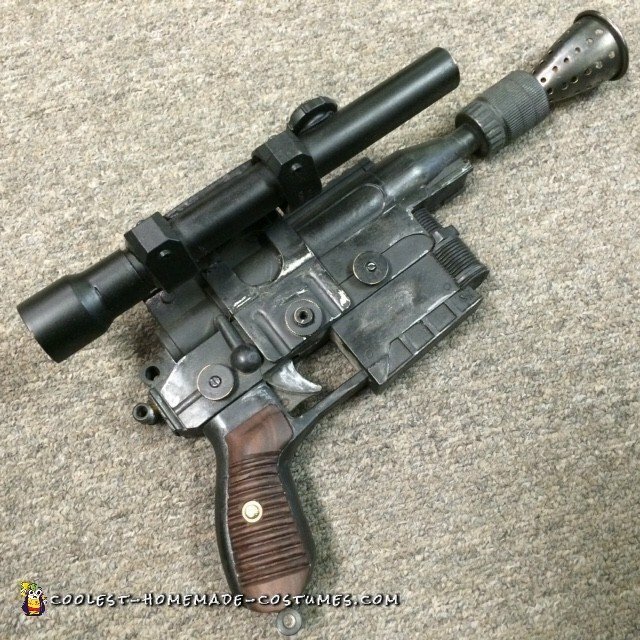 This is pretty ironic since the original Han Solo blaster was modeled after the World War 1 Mauser C96 Broom Handle pistol. Additional washers, bolts, gears and knurled knobs gave it added realism. I painted the entire blaster with matte black primer, then applied silver paint followed by a layer of gloss black paint. I was then able to age and distress the blaster by sanding off the gloss black paint at high points and other areas of wear. This exposed the silver paint underneath giving the impression that the gun was made of painted metal. 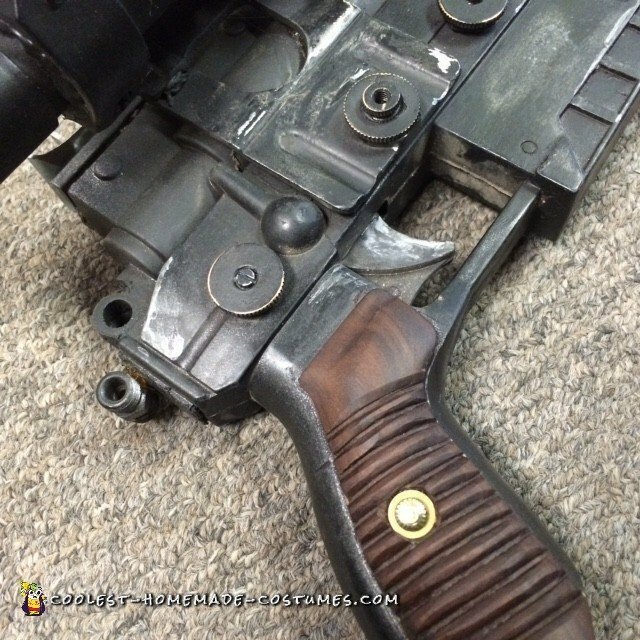 I reshaped the pistol grip and added hand carved wooden slats for an added sense of realism. 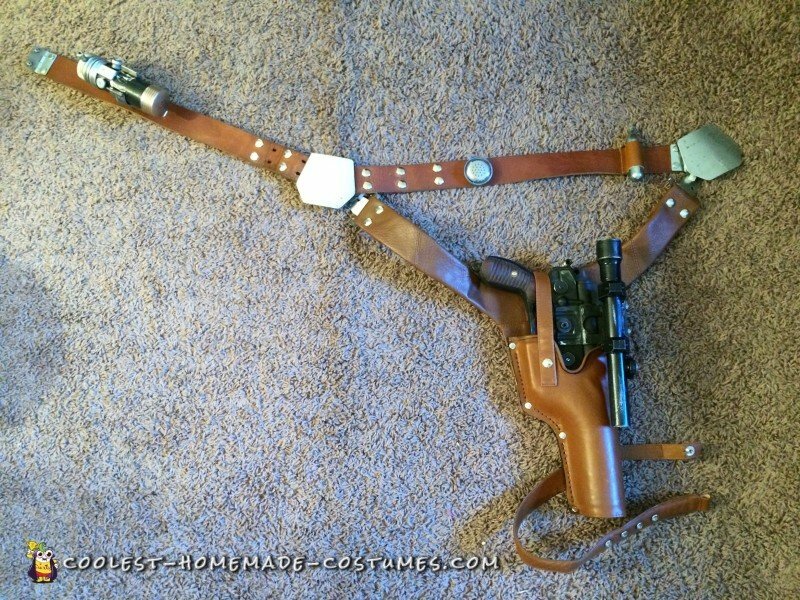 The holster actually took more work and design effort than Han Solo’s blaster did! I started to think I was nuts for ever starting this project. The most challenging aspect was designing the belt buckles. There was nothing in the documentation that I found to indicate how the buckle worked, but I wanted to make sure it was functional. I settled on a design using magnets welded to steel plates to allow the most flexibility and functionality of the holster. I used a couple purses for the majority of the leather in the holster, but I quickly realized that the leather from the purse was too soft to be functional as a holster. The inside of the holster needed to be reinforced so I used a hair gel bottle. This allowed me to slide the blaster in and out of the holster with more ease. Once I had the primary holster and belt, I turned my attention to the accessories to flesh out the little details. Here’s where my creativity really kicked in. It took hours searching through every thrift store I came across. I didn’t even know what I was looking for, but I generally knew when I found it. For the main body of the droid caller, I cut up a track relay baton. I put a pepper shaker on one end and the spout from a Dunkin Donuts box of coffee on the other end. After cutting up a wire wisk, I placed it inside the caller to represent the focusing array. Then I added knurled knobs and bushings for additional details. 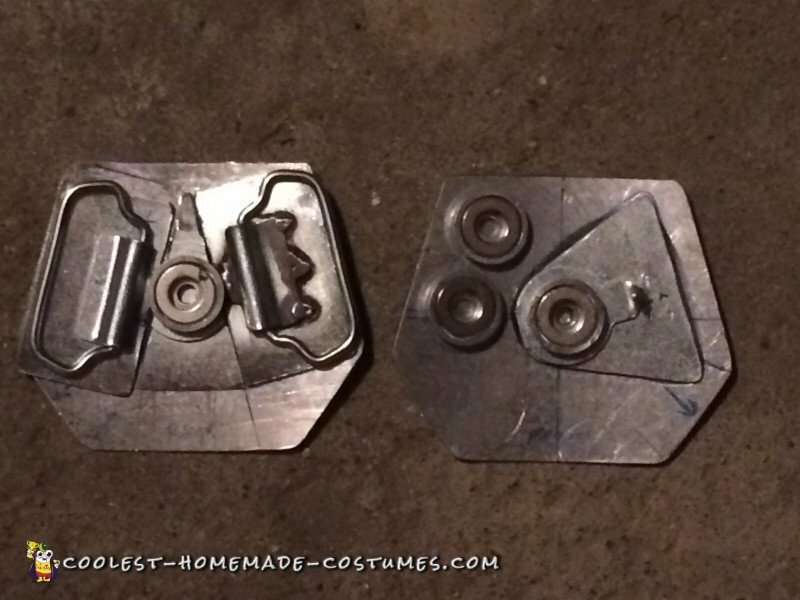 I riveted a mag light wall clip to belt to hold the droid onto the left side of the holster belt. The accessories on the right side of the belt were made from plastic window shade brackets that were left over from a remodel project of our front room. I glued on some phone jacks, a threaded brass rod, & nut along with some brass nails that I shaped to give them character. Well, I had come this far. 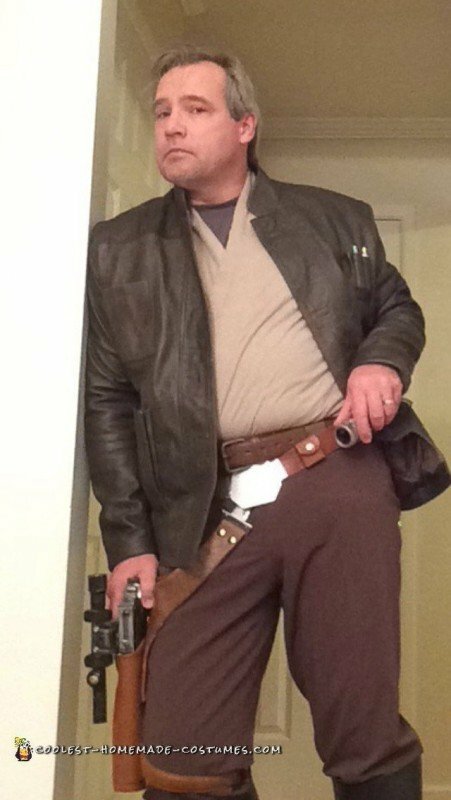 I made Han Solo’s blaster costume to see if I could. The holster was there to augment the blaster. I figured I had come this far, so I should make the actual Han Solo to go with it. Surprisingly, I found most of the clothing for this costume in the women’s section of the thrift stores. Shhhh. Don’t tell anyone. I had not seen any zippers or buttons in any of the movies. So a beige sweater wrap top looked like something Han could have worn. Since Han’s pants didn’t have any pockets, I found a pair of women’s pants that fit. I ended up adding 1.5″ ribbon for belt loops. I made spats out of a pair of women’s boots to wear over my shoes. Luckily, at the last minute I found a pair of riding boots that fit me. So I was able to used them instead. The jacket was purchased from a film replica company, but everything else was scavenged. I enjoyed the process, and my wife is glad to have me back. He he he. 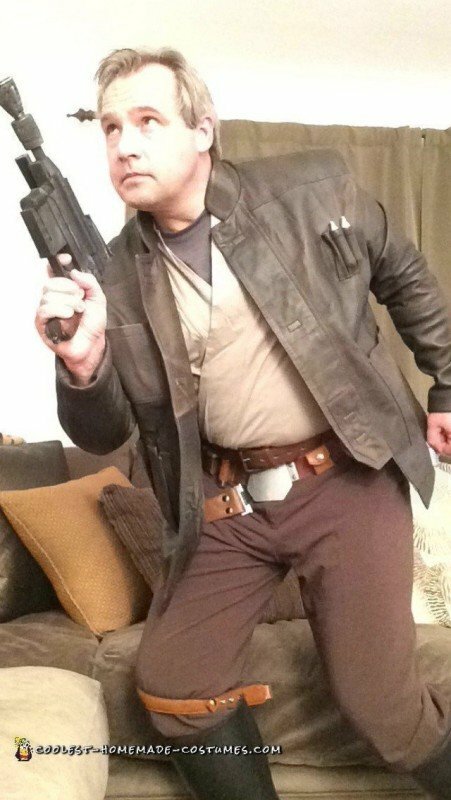 I first wore my Han Solo blaster costume to Comic Con in Detroit and I was surprised by the reactions I got. I got two types of reactions. The reaction from the Star Wars reenactors was that of amusement. They thought my Han Solo’s blaster costume was nice, but not authentic enough to be allowed into their club. Other people came up to me and wanted to have their picture taken with me. I even had two kids ask me for my autograph. LOL. I never had that happen before! Maybe I’ll do another one next year. Happy Halloween! 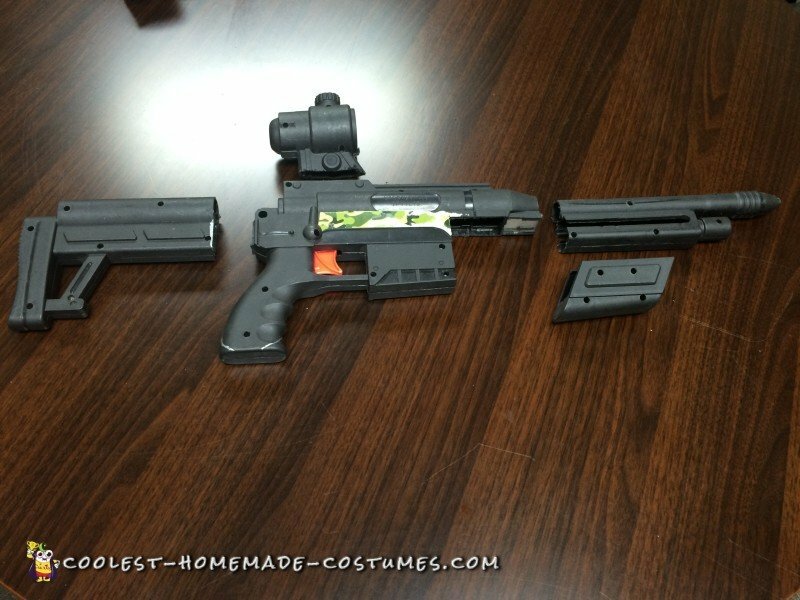 I hope you enjoyed reading about the fun I had making my Han Solo’s blaster costume.